Posted by Dissent at 11:10 pm	Hack, Health Data, U.S.
Update of Dec. 23: As of this evening, the hacker has not responded to a request from this site that they provide proof of access to PHI. And according to a MedHost spokesperson, they will not be reporting this incident to HHS because no PHI was accessed. Under the circumstances, unless more emerges, DataBreaches.net is closing this incident and not including it in our monthly statistics. MEDHOST did not immediately reply to an inquiry sent by DataBreaches.net asking them to confirm or clarify the attackers’ claims. This story will be updated as more information becomes available. MEDHOST has full control of the domain, and the restoration of the domain and associated applications has been completed. Depending upon geographic location, sites may already have full access, but it is possible that the DNS restore process could take up to 24 hours to propagate the changes due to TTL. Intermittent application impact may be experienced by end users during that time. MEDHOST wants to reiterate that there is no indication that sensitive information was comprised and the incident didn’t extend beyond the redirection of the MEDHOST DNS to a static site with the message your article referenced. We strive to provide a robust and secure platform for our clients and continue to investigate this incident and its root cause. But is this a reportable breach under HIPAA? Send in the lawyers….? This is an update on the resolution of the MEDHOST.com domain incident. 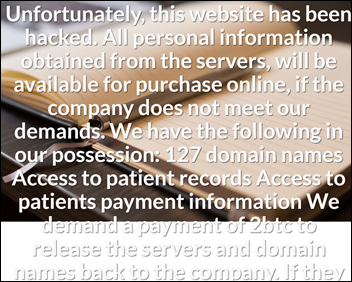 On 12/19/2017 MEDHOST’s account with our internet domain registrar was compromised and our public facing URLs were redirected to a site that stated patient data would be sold if we did not meet certain demands. MEDHOST has no indication that patient information was compromised, and throughout the incident, we remained, and continue to remain in full control of our internal systems. MEDHOST has full control of the domain, and the restoration of the domain and web-based applications has been completed. Depending upon geographic location, some customers already have full access, but it is possible that the process could take up to 24 hours to propagate. Intermittent application impact may be experienced by end users during that time. We are continuing to investigate this incident and its root cause. DataBreaches.net also sent an inquiry to the hacker asking for any proof of his/their claims, and will update this post if a response is received.